Here at C & B Coal, we've been serving the Rossendale Valley and surrounding areas for over 80 years. We stock a wide range of fuels, designed for almost all domestic uses, from open fires, to multi-fuel stoves and cookers. If you're unsure of the appropriate fuel, or the benefits of each, don't be afraid to ask our expert staff who'll be only too willing to offer guidance. We have a friendly Cash & Carry based in Waterfoot where you can purchase and collect fuel at your convenience. 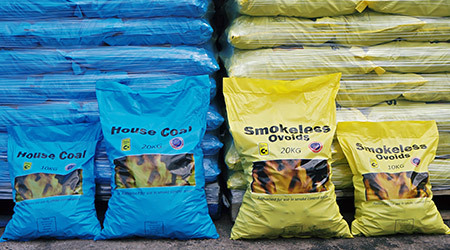 We offer local delivery of coal, kiln dried logs, smokeless/non smokeless fuels and garden supplies in areas that include Rawtenstall, Edenfield, Stacksteads, Bacup, Stubbins, Ramsbottom, Whitworth, Shawforth, Darwen, Clitheroe, Crawshawbooth, Haslingden, Bury, Rochdale, Todmorden, Blackburn, Edgeworth, Egerton, Tottington, Burnley, Colne, Nelson, Brierfield, Langho, Barnoldswick, Rishton, Weir, Greenmount, Birtle, Heywood, Belmont, Tockholes, Oswaldtwistle, Accrington, Padiham, Hapton, Whalley, Foulridge, Barrowford, Earby, Barley, Worsthorne, Cliviger, Cornholme, Walsden, Milnrow, Newhey, Norden, Lovecough, Dunnockshaw, Littleborough, Britannia, Water, Lumb, Townsend Fold, Ewood Bridge, Irwell Vale, Shuttleworth, Holcombe, Holcombe Brook, Summerseat, Walshaw, Elton, Ainsworth, Chapel town, Hawkshaw, Whittlestone Head, Hoddlesden, Belthorn, Feniscowles, Pleasington, Mellor, Brown Hill, Whitebirk, Wilpshire, Clayton Le Moors, Read, Great Harwood, Fishpool, Cutgate, Church, Huncoat, Altham, Simonstone, Newchurch in Pendle, Chesham, Bamford, Higham, Freetown, Fairfield, Pimhole, Holme Chapel, Makinholes, Blackshaw Head, Fishpool, Walmersley, Brandlesholme, Fairfield, Heap Bridge, Guide, Fence, Roughlee, Blacko, Salterforth, Billington, Facit, Clow Bridge, Goodshaw, Rossendale, Newchurch, Waterfoot, Cowpe, Helmshore, Acre and Briercliffe. We can deliver anywhere across the UK, either by traditional 50kg or 25kg local deliveries, or longer distance pallet delivery in 10kg or 20kg bags. If you're at all unsure about the right fuel to choose, don't hesitate to give us a call - we'll be more than happy to advise. We have a wealth of experience in fuel types, and make sure you get the right fuel for your needs.